It is no secret that I have a bad sense of direction. When I got lost in Lowe’s after asking directions to the restroom, I was reminded of a trip I took over 30 years ago when I [again] went in the wrong direction. At the time, I was a single parent of two early elementary school children. I had graduated from law school in May and had taken the two-day bar examination the day before this trip. In fact, the purpose of this trip was to let me unwind before rejoining the children who had stayed out-of-state while I prepared for and took the test. The problem was that after the test, I felt as though I had experienced a “mental enema”. And, I was sure that I had failed. I left the rental house in Knoxville to visit friends in Bristol, Tennessee about 120 miles away. I was supposed to arrive in time for lunch, so I left about 9:00 in the morning for an arrival time well ahead of the lunch hour. The directions said to travel on I75/I40 to I81. My friend’s directions were accurate and I would have been there well before noon if I had followed them – but I didn’t pay attention and found myself at the Tennessee/Kentucky state line. ? ! ? The kind lady at the welcome center said that to get to Bristol, I should “go to Knoxville and then take I81.” I was embarrassed to say that I lived in Knoxville, so I said I had just come from there. 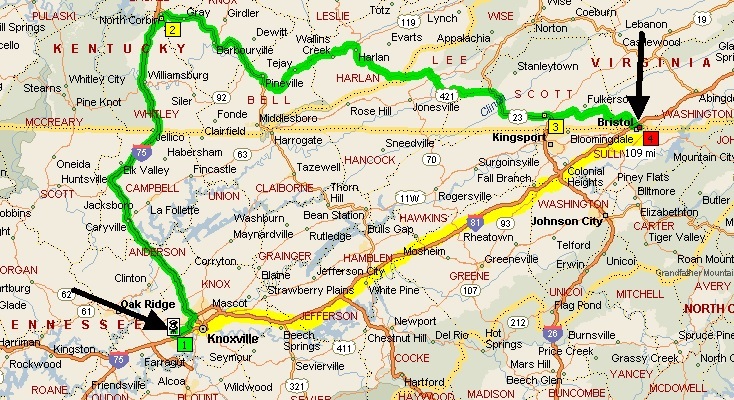 Her response was that I could take I75 to Corbin and then take Route 25 and 23 over to Gate City, which runs into Bristol. She said it with the implicit inference that either way would be fine. No real difference between them – you pick! 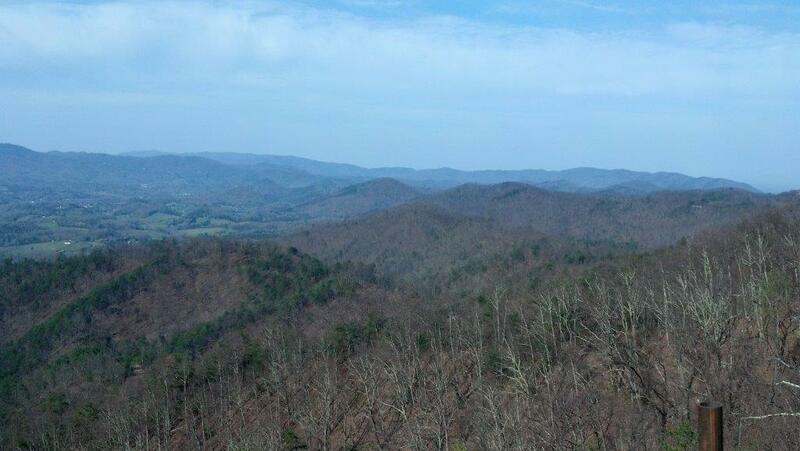 Not wanting to backtrack, I began the trek to Corbin, after using a pay phone (no cell phones back then) to call my friends to say that I was in Kentucky and would be a little late for lunch. It was at that time about 12:30 p.m.
As I drove, it became apparent that this was no Interstate – it was a highway through the mountains, with steep drop offs on the side and, more importantly, no civilization in sight. Just road and mountains. At this point, I looked at my gas gauge and at the temperature dial and was horrified to see that I had no gas and the temperature needle was completely in the red zone. Then I saw something coming out from under the hood. I had no idea where I was, other than in the middle of nowhere! Pulling to the side of the road, I sobbed into the steering wheel for what seemed like hours. I looked at the dashboard – still no gas but the temperature was normal and nothing was spewing from under the hood. I timidly turned the ignition switch, the car came to life, and the trip continued. The Lord even provided sufficient gas to reach Gate City and a service station several hours later. I remember the incident like it occurred yesterday. But sometimes I forget that He is and has been with me throughout all my life: when that happens, I need to quiet my heart to hear His loving Spirit speak to me. Beloved, He knows where you are, and where you are going, even when you don’t. Trust Him through the faith we have in our Lord Jesus Christ. You are in secure hands. Amen Garry. His Absolute Sovereignty is an attribute in which we have total comfort. Praise Him. Is that common with lawyers? I am also terrible with driving directions. And I have also gotten lost on the same route more than once, except reverse – Bristol to Knoxville – and ended up in VA. And at least once the fuel needle was also desperately on E before I had to pull into a gas station for gas and directions. I have a similar story, except mine was pre-bar exam. I was driving from VA to Knoxville to take the TN bar exam. I got stopped by a cop and got a speeding ticket, then I got lost on the way and did not have a cellphone at the time so I had to stop and use a payphone to update friends who were expecting me for dinner. I arrived embarrassingly late in Knoxville and almost missed dinner date with friends at a restaurant with about 40 minutes before closing time. I must confess, there was no peace or calm; I was just raging mad that all of that had to happen just before a stressful event. But all of that chaos, including my poor attitude, was choreographed by Sovereign God to lead to gracious outcomes that He long ago made certain. I passed and started practicing several months later. That’s why I really love Him and feel so secure about His absolute control over every thing.